Piano : Australian anthology, preliminary to fourth grades. Published by Allans Music — 2003 — 1 vol. of music (48 p.) ; 31 cm. Also includes: Prelim grade: Red Indian hand game song / Sitsky -- Wandering wombat / Mageau -- Staccato imitatuion / Carr-Boud -- Prayer of the swinging mantis / Jones. First grade: Forecasts / Mageau -- Prayer / Hannan -- The ghostly huntsman / Holland -- The apple tree / Hiscocks. Second grade: A brolga behaves like Bartók / Ford -- Singin sun / Sculthorpe -- Claok and dagger / Milne -- Speckled grasshoppers / Whiticker. Third grade: Ambling along / Symons -- Gentle giant / Hindson -- 5 to 4 / Polden -- Cool... / Broadstock -- Spider on the mirror / Brandman. Fourth grade Emily's song / Edwards -- As you like it / Leek. Includes brief biographical notes on composers and performance notes. Includes pieces suitable for students at AMEB Preliminary to Grade 4 level. 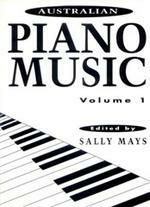 Score: Australian piano music : volume 1 / edited by Sally Mays. Score: Forecasts : for piano / by Mary Magdalen Mageau. Score: Australian piano music : volume 3 / edited by Sally Mays. Score: Gentle giant : for string orchestra / Matthew Hindson. CD: Piano games : Australian post-1970 solo piano works.